THE WORLD’S FASTEST SOLAR CHARGER, PERIOD. Featuring 14W 2.7 AMP USB-C charging. The Rapid Sol charges tablets, phones, action cameras and faster than ever before using Solar. Using Sunlight + Built in 3700 MAH LiPo Battery, The Rapid Sol generates enough power for any type of user. Simple, it actually charges your devices quickly using solar energy. 5 LED strobe and power status indicator. USB C – USB A adapter. We have equipped the Rapid Sol with the latest USB technology to allow you the fastest charging speed and to plan for the future. One of the only flexible mono crystalline designs in the world. Charges most phones in less than 1 hr. Q: Does the solar panel replenish the built In battery on the RapidSol™ quickly? A: Yes, absolutely. When receiving sunlight, the RapidSol tells you how much energy you are putting into the battery via the 5LED indicator lights. When flashing 3 or higher, the RapidSol can charge extremely quickly. Q: Is the RapidSol Water Proof? A: The panel itself is water proof, any water on the panel will not harm the panel at all. Limiting water exposure to the circuit is highly recommended as this portion is not completely water proof, however is water resistant. The STEADY SOL panel is completely water resistant, with a resistant circuit featuring a rubber close loop for the USB circuit. Q: What do I do if it overheats? A: If you are in high heat over 85-90degrees F, 29-32 Celsius, for best performance keep battery portion covered with cloth or in shade or let it cool in a cold place if you see cylon indicator blinking only “1” direct sun after 10-20 minutes. Usually throwing in a freezer for 10-15 seconds will immediately solve this issue or storing it in a cool place for 90 seconds will allow you to get 5 leds. Rapid Sol will still work in high heat but will collect energy at 30% speed due to safety reasons. Do not leave Rapid Sol™ or any battery / power bank in temperatures of 90degree F or more for a duration greater than 55 minutes for safest use. When functioning properly Rapid Sol will blink 1 even under a bedside or table lamp with a standard light bulb after circuit button is pushed once. Push button to see charge status/ turn on solar meter. Do not to bend Rapid Sol past 15 degrees. It is only flexible to allow easy attachment to items. Be sure to read instruction manual for proper use. Q: How fast is the Steady Sol panel compared to the RapidSol™? A: The SteadySol panel features a 1 AMP output, the RapidSol™ panel features a 2.7 AMP output. Q: Can it charge tablets? 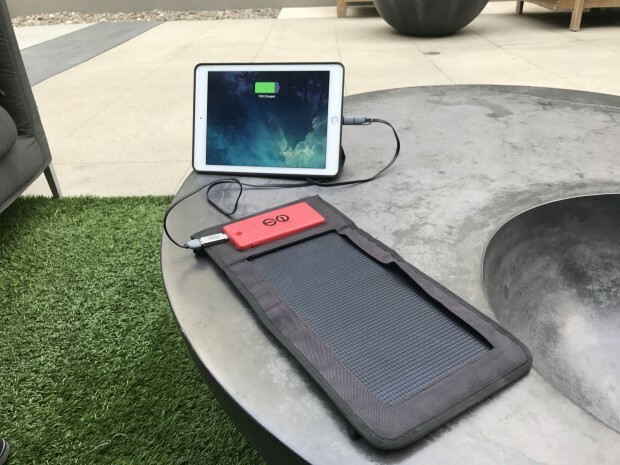 A: The Rapid Sol™ has a 14W total output & can absolutely charge most tablets with USB input, however it will require ample sunlight to do so. Q: Will Evolution Wear provide support after the RapidSol™ is purchased? A: Yes, absolutely, all products are covered by 90 day standard warranty. You may also purchase the Care Package for an additional 18 Month Additional warranty. Q: What is the wafer efficiency of both of the panels? A: Both products the RapidSol™ and SteadySol™ feature a 22% fully encapsulated wafer efficiency and a 24% raw wafer efficiency. Making them among the most elite tier of solar wafer quality.